CRISPR is an acronym for Clustered Regularly Interspaced Short Palindromic Repeat. CRISPR is also called as CRISPR/Cas9. The scientific world is attracted by this revolutionary technology. CRISPR technology is a simple yet powerful tool that is used for editing genomes. This technology is used to alter the DNA sequence and modify gene function. Its major application includes correcting genetic defects, treating, and preventing the spread of diseases and is also used improving crops. The technological advancements are the key factors attributed for the growth of the CRISPR market. Increase in the prevalence of genetic and growing drug discovery activities are expected to boost the market revenue growth. The growing demand for synthetic genes and increase in the R&D expenditure on biotechnology and raising government expenditure on genetic research is enriching the growth of the CRISPR market. However, complications such as gene editing of germ line cells are hindering the growth of the market. Since the changes made in germ line cells are transferred to the next generations. The gene editing of germ line cells also has ethical issues and is illegal in most of the countries such as the UK. Limited awareness is another factor hindering the growth of the CRISPR market. Geographically, global CRISPR market is segmented into North America, Europe, Asia Pacific, Latin America, and the Middle East and Africa. North America CRISPR market expected to be dominant market when compared with that of the other regional markets. The technological advancements, increase in the R&D expenditure, and the increasing government funding expected to create demand for CRISPER. The Asia Pacific is expected to show significant growth over the forecasted period. 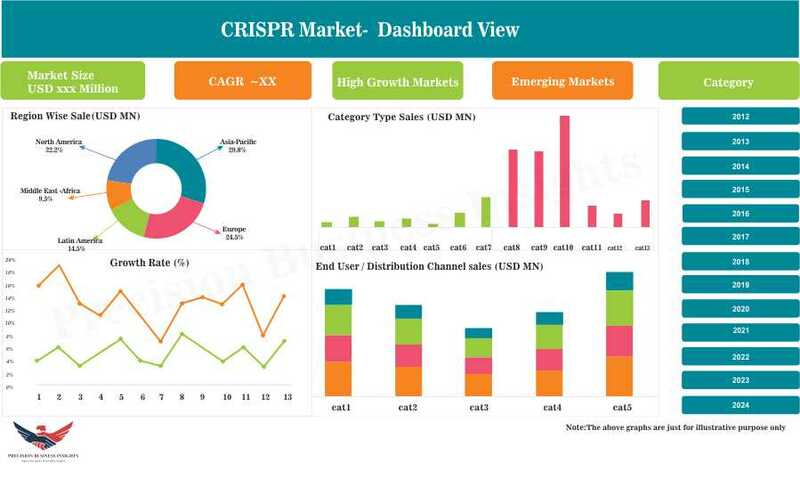 The growing prevalence of the genetic disorders in the emerging economies such as China and India are expected to boost the market growth of the CRISPR market.